An event has left the world in ruin. Technology now lies defunct, people are sparse and you are alone. Fortunately, the protagonist in Chronology is an inventor who just happened to make a watch that allows him to travel back in time to a fixed point. Determined to right the wrongs of his mentor, the antagonist who's blind ambition caused this destruction, the inventor sets out on a quest. 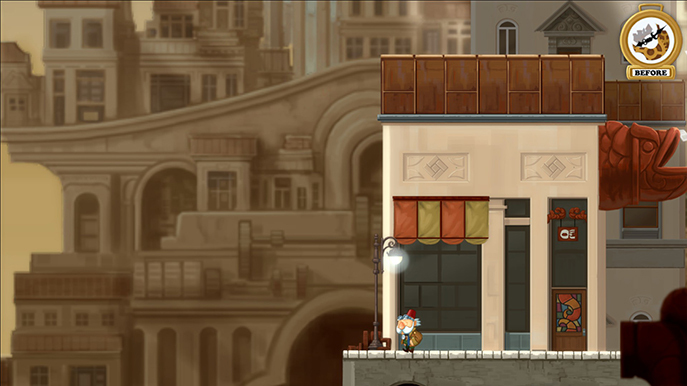 Chronology is a 2d platforming puzzle game. The 1080p visuals are immediately striking in their charm and remain so throughout this short adventure. One of the main mechanics is available immediately. The inventor finds his watch at the start and this allows you to switch between the present day and the past. 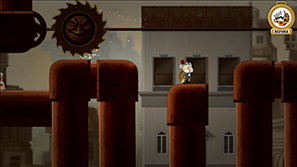 The game heavily revolves around this, both in it's platforming and puzzle sections. If you reach an impasse in your route, simply switching time often reveals a path to overcome the obstacle. More often than not it is more complex. You'll meet plants and creatures that are in need of something and helping them out results in them returning the favour. Early on you find a plant in the past desperate for water. In the present the plant is long dead and wilted. Give it the water in the past and in the present it will have grown and bloomed, offering you platforms to travel across. There are items littered about. You can pick one up at a time, use them, and on one occasion combine two. Most of the problem solving is fairly clear and easy to execute and solve. Button prompts are very helpful, mainly because there are so few it's pretty simple to find the solution to any puzzle. The platforming control isn't that tight, jumping is a little floaty, but the game never requires you to perform any precise movement. You are not alone in your quest to find your mentor. Early on you encounter a talking snail, a former experiment discarded by the antagonist, who wants to help get revenge. The snail has a power of it's own – the ability to stop time. You are able to move about freely while everything around you is brought to a halt. You switch control of characters with RB and use their ability with B. 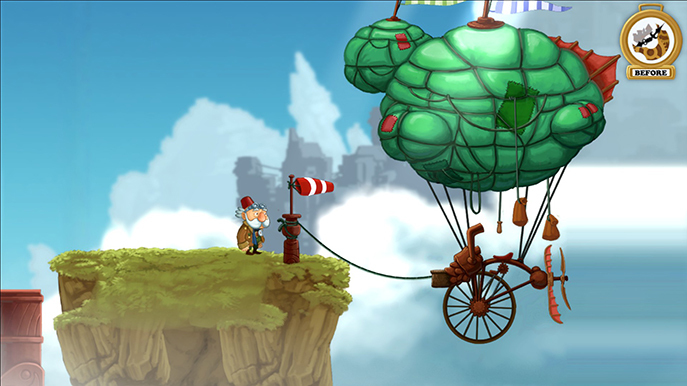 The Snail can be used as a platform for the inventor when gaps are just a little too big. Thankfully you don't have to move both characters along to further the level. 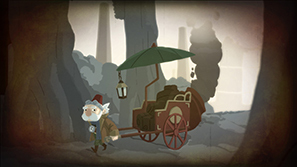 The inventor can shout and The Snail will teleport to your location. This is a relief as it can be very frustrating having to move both characters along the sections (think of The Cave). 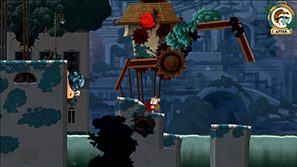 This combination of mechanics – travelling between the past and present, being able to stop time, moving Snail for use as a platform and item interaction – mean that puzzles are varied and interesting throughout the game. It took me just under two hours to complete and that felt about right. You travel to a varied number of environments, all beautiful to look at, and solutions rarely repeat. However, the puzzles remained fairly simple and easy to solve throughout until the final three main puzzles. These were a lot harder and more complex than anything you'd faced before. While I completed two of them with little anguish, the first of the three had me guessing. Ultimately, I had to look online for a solution to one stage of the puzzle. The solution was not something I had contemplated and felt very unclear. 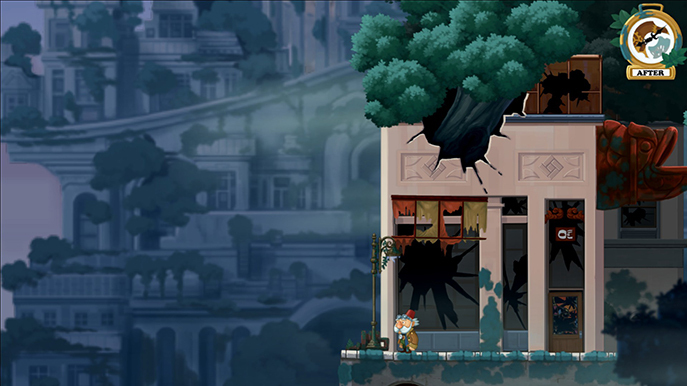 The tone of the penultimate puzzle felt off compared with the game, albeit a game in which total destruction has occurred. You ultimately have to cripple a boy in the past in order to steal the cane he now relies on for movement for a solution to something. In a world full of charm and whimsy this was uncomfortable and completely out of place. The Inventor shows no remorse for this course of action either. The accompanying music and voice work is good throughout but I could not stand The Snail's voice. It is comparable to Taokaka from Blazblue. High pitched and childlike, it was just unpleasant to listen to. I mostly had a good time with Chronology. The puzzles are clever albeit easy and the presentation is fantastic. The Miyazaki inspired world and characters are a joy to see and interact with. The combination of mechanics ensure the game remains interesting throughout with little repetition. It is unfortunate that the game is so easy right up till the end, where the difficulty spikes considerably. There isn't a middle ground leading up to it. I would have liked it to have provided me with a little more challenge (barring that one puzzle area in which I was stuck). 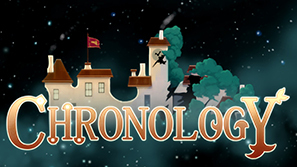 Chronology comes recommended to those that enjoy pleasant platform/puzzle games.